Caperdonich is one of those distilleries that was built in the boom of the 1890s and mothballed just over a century later. The distillery was christened with the uninspiring name "Glen Grant #2" and was originally built with a pipeline connection to neighbour Glen Grant. Within five years after opening in 1897, the site fell silent, a fate shared with many distilleries in the wake of the Pattison crash(1898), and would not operate for over SIXTY(60) years!!! It was at this point the the name Caperdonich was assigned. The distillery operated as a part of Seagrams' Chivas and Glenlivet Group and just one year after Pernod Ricard took over the Chivas Group in 2001, Caperdonich was motballed (2002). This is a cask-strength whisky, but you will note that it comes in at just 0.6% over 40% abv. By law, Scotch whisky MUST be bottled at a minimum of 40% abv. 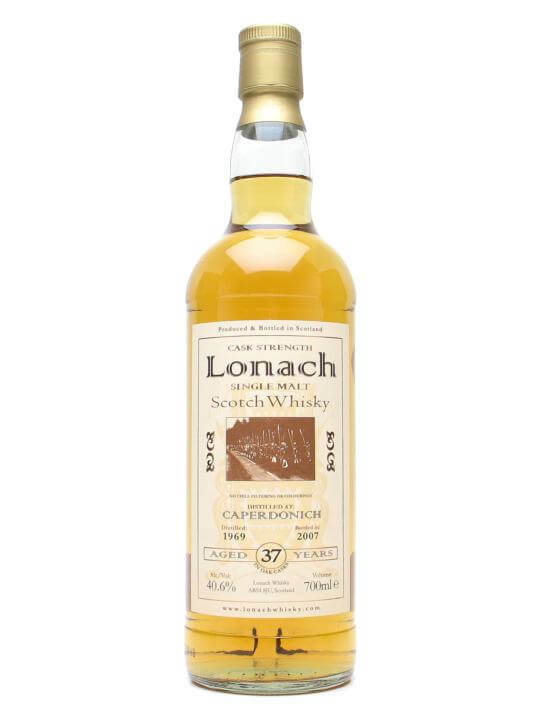 The Lonach collection from independent bottlers Duncan Taylor & Co. are bottlings made up of matured same-distllery vattings of casks that have fallen under-proof(ie. below 40% abv) with casks that have not. Whiskies falling under-proof is more common than many of us realise and most of these casks become constituent parts of deluxe blended whiskies, mixing with casks that are 50-60% abv, thus bringing the median up above the legal minimum. Euan Shand and the folks at Duncan Taylor use the single-distillery vatting method with these under-proof casks and thus create bottlings that, by law, remain Scottish Single Malt Whiskies. Clever. Freshly cut pineapples in a wood salad bowl. Oak that comes off like disposable diapers/nappies (yes, clean ones). Some jam. Quite fruity and sweet and not a note out of place. Warming and buttery eruption in the mouth, some baby powder, gets touch musty at points and even sour before getting incredibly nutty and toasted, roasted hazelnuts. Some raspberry, too. There is a very late flavour of green olives among a very dry oakiness. Fruity sweet and incredibly oaky. Seems to have gone a bit beyond the "sweet spot" in terms of maturation, especially noticeable on the palate, but with a wonderfully constructed nose and such good value for the age, I can't really knock it.